A Slice of Smith Life: 13 Years Ago Today: A Tribute to our Millennium Baby! 13 Years Ago Today: A Tribute to our Millennium Baby! 13 years ago today we were blessed when we held you in our arms for the first time. Here you are with Daddy and Mommy when you were just 2 weeks old. I remember that even as a little girl you loved learning about our Catholic faith. I remember for your First Holy Communion five years ago, we went and took a picture at the same church that I received my First Holy Communion. I remember thinking "Wow! You really do look like me!" I remember that you loved and continue to love our family traditions and how you light up our lives with your smile and sweet personality and talents each day. 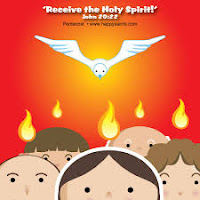 What a busy weekend we have had celebrating your birthday, watching your brother play in a local soccer tournament, and today we celebrated the birthday of the Church for Pentecost Sunday as we hurried to Mass after your brother's last soccer game this morning. You had fun Friday night as you played miniature golf and arcade games with some friends and then came home and had a cookie cake that I made and decorated. The cookie cake recipe was delicious and can be found HERE. I smoothed the "putting green grass" on the cake using the easy paper towel method that I used on your skate cake last year. After Mass this morning we took a family photo with your brother still in his soccer uniform (but Dad and him have red on, the liturgical color for Pentecost!) and you have your new outfit on that we gave you for your birthday. Me with my millennium "baby"! Happy Birthday to our beautiful TEENAGER inside and out! I can't believe we have a teen in our family! :) We love you and wish you a blessed 13th birthday! Aw, beautiful pictures! Your daughter is lovely...loved watching her grow up through the photos. A wonderful tribute to your beautiful daughter! I have been through the teens with two of my children, and two of them are now teenagers... there is plenty of teen angst to be sure... but it is also pretty wonderful to watch them grow and mature into young adults. May God bless your daughter! What a touching post! I love it! Happy Birthday to your blessing! You look awesome BTW! Happy birthday to you BEAUTIFUL young lady. May God keep her and bless her abundantly! 30 Weeks Down...10 To Go!